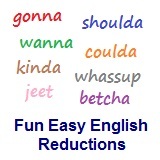 ﻿ Fun Easy English - new-american-english-reductions-reduced-words-topic-word-have-must-have-musta. In this lesson you will learn the American English reduction musta. She musta been really tired after working so many hours. She must have been really tired after working so many hours. I musta been crazy to drink all that whiskey last night. She musta tried to call at least 8 times. He musta been tired from staying up until the next morning. I musta thought about her a million times this year. They musta been disappointed about not making it to the playoffs this year. Musta is used when talking about a past action. Reductions, such as musta are not real words in English. Video: Parmalee "Musta Had A Good Time"
Lyrics: Parmalee "Musta Had A Good Time"
Hey, y'all, is that my dog up on the roof? And, good God, why's my car out in the pool? Oh Man, who's that passed out in the yard? Hey y'all why's my bed not in my room? And, good God, how did my face get black and blue? And the girls all getting down! Who's that passed out in the yard? Man, there's a hole punched through my door! But we musta had a good time! Oh Man, somebody's passed out in the yard? But, we musta had a good time! Heh, heh, heh... yeah we musta had a good time! We SHORE had a good time! We always have a good time!